Officer Eric White and Officer Jason Wolfe were shot and killed while investigating a shooting call at an apartment complex on West Las Palmaritas Drive. The first officers to arrive at the scene located a male who sustained a gunshot wound to the chest. The shooting victim was transported to a local hospital as officers began evacuating residents and searching for a suspect. The suspect was located in an apartment in the complex and several officers converged on that location. Fearing the gunman was holding a hostage, Officer White, Officer Wolfe, and a third officer kicked the door in and attempted to enter the apartment. The gunman immediately opened fire, striking all three officers. Officer White and Officer Wolfe were killed, and the third officer was wounded. When another officer returned fire, the suspect retreated back into his apartment and committed suicide. 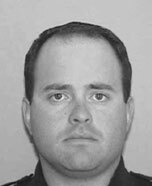 Officer White had served with the Phoenix Police Department for 4 years. He is survived by his wife and two children.